“Jesus is Risen!” A gathering of Uduk men is singing the praise chorus in their native tongue. Their voices gain strength with each verse and float out into the warm, still air of the Doro refugee camp in Maban County, South Sudan. The camp is home to an estimated 48,000 refugees from Blue Nile State, including this large group of Christian pastors and elders. The psalm rises over the nearby huts to a clearing where many women sit together. A little distance beyond is a cluster of tents where children are being measured, weighed, and evaluated for malnutrition and where their mothers place small parcels of emergency food into tattered plastic grocery sacks. Help Victims of Violence in South SudanAlmost 50 men have gathered under the thatched roof of an open-air church. Though it must be a chore to keep their clothes clean from the ever-present ochre dust, the men all wear dress pants and pressed shirts. They sit on plank benches, each one holding a pristine copy of a hardcover Bible. Normally, the women would have been present, joining in the worship service and making tea and coffee for the men and their guests. Instead they are comforting a woman whose husband has been killed. He was shot in the fields outside the camp when he went to work. The men gathered here have lost many things: wives, children, brothers, sisters, friends, their homes, and their villages. But God has given them a teeming city of almost 50,000 souls from many tribes and tongues in the Blue Nile State. Though the fields of Maban County are an ever-present danger, they are also ripe for harvest. Pastor Andrew is working with Samaritan’s Purse to take the Gospel to his fellow refugees. Pastor Andrew Kena, a native of the region, was a local pastor in the adjacent town of Bunj for 15 years. Increasingly, he has been raised up to fulfill a role much like Paul or Titus. As a ministry coordinator for the Samaritan’s Purse field office, he speaks at different churches in the Doro camp every Sunday, leads evangelical events, shows the Jesus film, and encourages the growing body of Christ within this camp as well as two others. The outreach is bearing much fruit. Hundreds of new brothers and sisters from many different tribes and backgrounds are being added to the family of God. When days of peace do come, the Gospel will go with them to the Blue Nile State, Sudan, South Sudan, Ethiopia, Kenya, Uganda, and beyond. These new followers of Jesus will rise up and take something else with them when they go: a Bible in the Uduk language. 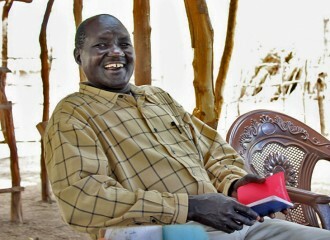 Pastor Abraham is thankful that he can help replace the Bibles that many of the refugees left behind. The translation of the Bible into Uduk, made possible by Samaritan’s Purse, has been a labor of love for Doro refugee pastors Solomon, Jima, and Rubin. With Pastor Andrew’s assistance, these three men now hold the fruit of their labor in their hands—2,000 freshly printed New Testaments (with the addition of Genesis, Exodus, and Psalms). The precious Bible arrived in the camp to great jubilation. The pastors recently divvied them up among the members of their 19 existing congregations. At the service on this Sunday, one of the elders holds up his new Bible. “We are very happy and praise God for Samaritan’s Purse in helping us get these Bibles into the hands of our people,” he said. “Good tongues” is the beautiful phrase he uses to describe their joy. Pastor Abraham is fearless about asking for a double measure from God. Voices pipe up from around the room. 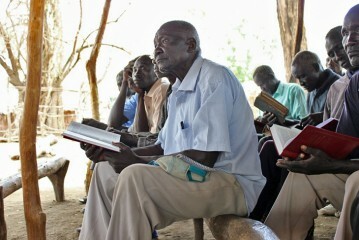 Pastor Solomon helped translate the Bible into Udek. The men conclude the meeting with prayer and disperse to their day’s work, clutching red books filled with the story of the God Who lived as a refugee, died a horrible death, and was killed by violent men. It’s a book about the God Who was raised from the dead and has gone to build a new home and a new village in heaven for those who believe in Him and who is present as they minister in the refugee camp. The song lingers in the warm air.